...was pretty much all we heard once an Angry Birds movie was announced. Whilst there may have been some merit to these comments, many people, in fairness, could've relaxed and given things a chance instead of jumping to fierce conclusions; though I guess that's what the internet is all about at the end of the day. As time went on, and more and more trailers came, opinions remained divided, and for many, the notion of a movie adapted from a mobile app seemed a bit too much. The end result, however, is surprisingly decent; not a masterpiece, but genuine effort is visible. After too often letting his temper overwhelm him, Red (Jason Sudeikis) is finally sentenced to Anger Management Class, where he befriends (used loosely) the lightning fast Chuck (Josh Gad) and (literally) explosive Bomb (Danny McBride). As their classes proceed, the world of Bird Island is suddenly visited by a tribe of pigs lead by the charismatic Leonard (Bill Hader), who initially seem carefree and open to friendship, but whom Red sees have more sinister intentions behind their happy masquerade; and one he and his new friends must fight to stop before time runs out. From a visual perspective, Angry Birds finds just the right style for it's narrative content, creating a colourful world with lively characters and some gorgeous backdrops, with plenty of attention to detail in key areas. Characters are animated fluently and with tons of personality, and so each one stands out at first glance - even if many of them suffer when it comes to further development. Indeed, considering so much initial backlash was present over it's laziness as an movie based on a mobile app, the effort injected into the overall aesthetic design is surprisingly strong. The characters are just as equally brought to life thanks to passionate effort from the cast, particularly Sudeikis as Red (despite his occasional cheesy sarcasm) and especially Bill Hader as the villain Leonard / King Mudbeard, who isn't rich in his backstory or motivations, but still entertaining thanks to Hader's energetic voicework. 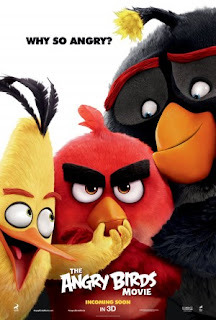 Angry Birds doesn't need to be emotionally powerful and full of societal commentary - however, complexity is almost entirely absent for the most part, which can result in many predictable scenarios and underdeveloped scenes. While the script is funny, some jokes often feel poorly timed as it seems the movie tries to avoid any effort to proceed with true emotion, and some of the more dirty gags, per se, sometimes feel in poor taste; that's not me trying to be some sort of overprotective parent, but many of them yield an initial shock factor and certainly not lasting humour. Those who are 100% not sold by the Angry Birds trailers may not find their opinions changed from full viewing - I myself thought it looked decent, and got exactly what the trailers promised. It's a harmless and reasonably enjoyable animated effort, with an especially chaotic and fun (if slightly contrived) final act, but there's not exactly a shortage of superior alternatives.